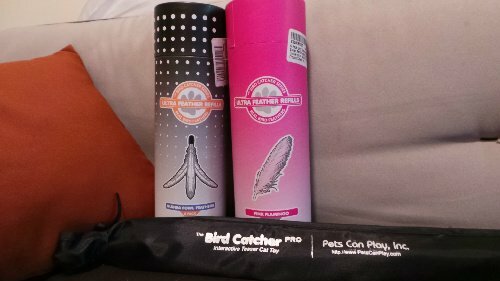 A few days ago, we received our new cat toy The Bird Catcher Pro, made by Pets Can Play, Inc. and we decided to make a quick video review of this cool toy starring our cats Pita and Tiger. This bird catcher cat toy is so well designed that even my husband loves to play! He also said, "Wish I had thought of this myself." Tiger, our male cat, was so excited with the new toy that he didn't even wait for me to assemble it...he just wanted to play! The toy comes inside a very nice bag, and there are 3 pieces where two makes the fishing pole - made of fiber glass and it has a padded handle. At the end is an eye to connect the different cat lures. The last piece is the line that you will need to attach to the swivel with the feather toy at the end. The toy comes with two different feathers, one with a bell and another without. The swivel allows the feathers to spin and move just like a little bird would. This toy make our cats act like real hunters! Pita, Tiger and I played a little over an hour before they crashed - exhausted, in our living room rug. After a couple hour break, I tried the other feather refills. The first one the Pink Flamingo, which was a bit different from the ones that came with the toy, instead of a line the feather was attached to an elastic band which allowed our cats to catch and take it a couple of steps before it retrieved itself. The second feather refill called Guinea Fowl Feathers were very similar to the original -- attached to a black line minus the bell. And if your cats are like ours, they will play with a new toy and then lose interest, until the next toy. With the bird catcher our cats have been playing every day, for a little over 10 days and they are still very entertained by the flying bird. 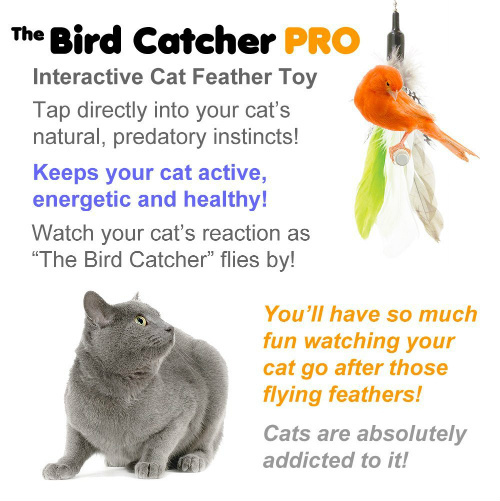 Our cats love this interactive cat feather toy! They both are having a lot of fun with this cat toy. This is probably the best cat toy we have tried simply due to the quality of the product. ** WARNING!! ** HIDE The Bird Catcher Pro when you're not playing. Your cat will watch where you store it and cats figure out how to open closets, drawers, doors just to find it. Ready to get yours? Just click here.